STATE COLLEGE, PA March 15, 2016 – Today the Summer’s Best Music Fest unveiled a lineup that’s bigger and better than ever, with headliners Sister Sparrow & the Dirty Birds and Doyle Bramhall II on top of the two-day, five-stage schedule. For the first time, the festival will feature a beer garden. In 2015, the festival began offering a ticketed national stage with one headlining performance. This year, the festival is building on that model, and ticketholders will have access to two stages programmed with 10 nationally touring acts. Summer’s Best has been working with Lucky Dog Management, a Johnstown-based company, on national bookings. 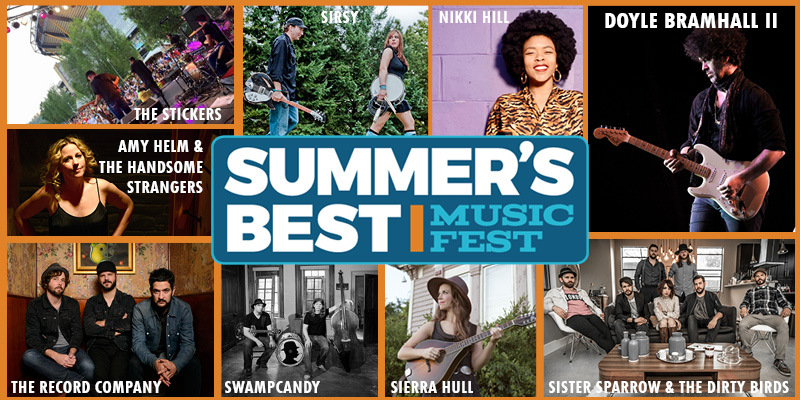 The festival has a new website at www.summersbestmusicfest.com, and is on Facebook at www.facebook.com/sbmf.dsc. The festival is presented by Northwest Savings Bank and produced by the Downtown State College Improvement District (DSCID). Additional sponsors include The Days Inn and Seven Mountains Media. For sponsorship information, contact George Arnold of the DSCID at 814-238-7004. Sister Sparrow & The Dirty Birds – Friday June 3rd at 8:15 p.m.
For nearly two decades, the Catskill Mountains hid rock ‘n’ roll’s best kept secret. Then one day, singer and songwriter Arleigh Kincheloe said goodbye to her hometown hideaway and moved to New York City to start the hard soul collective, Sister Sparrow & The Dirty Birds. In the years since, the group has performed more than 700 shows and made their national TV debut on the Today show. They’ve released three full-length studio albums, including their most recent studio pass, the acclaimed The Weather Below. Earlier this month, Sister Sparrow & The Dirty Birds finally appeased its flock of devotees by releasing its first live album – Fowl Play. The album was recorded on New Year’s Eve before a raucous, sold-out crowd in Fairfield, Connecticut and was the beautiful, accidental result of an original New Year’s Eve plan gone awry. Fowl Play captures the unbridled live energy for which Sister Sparrow & The Dirty Birds has become famous and finds the band rollicking through catalogue favorites past and present. Doyle Bramhall II – Saturday, June 4th at 8 p.m.
Bramhall II was raised in a home filled with the blues and rock & roll sounds that are indigenous to Texas (the state of his birth) thanks to his father, Doyle Bramhall, who played drums for blues legends Lightning Hopkins and Freddie King and was also an accomplished songwriter and vocalist. When Doyle was 18, he was recruited by Jimmie Vaughan to play with the Fabulous Thunderbirds. Bramhall II’s reputation blossomed and two years later, he co-founded the Arc Angels with Charlie Sexton and Stevie Ray Vaughan’s rhythm section; Chris Layton and Tommy Shannon. Bramhall II’s unparalleled skills as guitarist won the attention of both Eric Clapton and Roger Waters. Waters showcased the guitarist on his In The Flesh tour and accompanying album. Eric Clapton featured Bramhall II’s songs and guitar work as part of Riding With The King, his Grammy winning project with B.B. King. Clapton then recruited Bramhall II to join him on a full time basis and their association flourished. The guitarist toured with Clapton throughout the world and their dramatic interplay thrilled fans and immediately drew comparisons to past triumphs such as Derek & The Dominoes. Bramhall II’s distinctive guitar work—he is a left handed player who plays a right handed strung guitar flipped upside down—left an indelible mark on Clapton albums such as Me And Mr. Johnson and Searching For Robert J. In addition to Clapton, Bramhall II has been in demand as composer, guitarist and producer, collaborating with such as artists as Sheryl Crow, Tedeschi Trucks, Elton John, Questlove, Gary Clark Jr., Erykah Badu, Gregg Allman, Robert Randolph, T-Bone Burnett, Meshell Ndegeocello, Dr. John and many others. Bramhall has produced several records, including Crow’s popular 100 Miles From Memphis. You must have a ticket to access the Garner Main Stage and Garner Side Stage. Children 12 and under who are accompanied by a ticketholder get in free. Early-bird tickets are on sale online now for $25 for a two-day ticket, $10 for Friday, or $20 for Saturday. Prices will increase on April 15. The remaining three stages — Locust Lane Stage, Locust Lot Stage, and Calder Acoustic Stage — are free to everyone. A detailed schedule that includes set times will be released in the coming weeks. New in 2016 is the beer garden, which will enable patrons to purchase beer and malt beverages, including cider, as they enjoy the music and stroll among four of the festival’s five stages. The portion of the festival site that encompasses the Acoustic Stage and the Rotary Ice Cream Festival will remain alcohol-free. All patrons who intend to buy alcoholic beverages must bring their ID to be scanned, regardless of age or appearance. In addition, a wide range of food and merchandise vendors will be positioned throughout the festival grounds. As in previous years, the State College Downtown Rotary Ice Cream Festival will be held as part of Summer’s Best from 1-5 p.m. on Saturday, June 4. Each $5 ticket allows patrons to enjoy up to three two-ounce samples of ice cream and frozen treats from creameries across the state. Ticket sales last year allowed the Rotary to give back around $4,000 to organizations that serve the youth in our community. The Ice Cream Fest will be located on Calder Way between Pugh Street and McAllister Alley, near the Calder Acoustic Stage. No advance tickets to the Ice Cream Festival will be sold – instead, they will be available onsite the day of the event. The Summer’s Best Music Festival is produced by the Downtown State College Improvement District. DSCID is devoted to preserving and enhancing the value and vitality of Downtown, and works to retain, expand and attract businesses and investment to improve the Downtown environment. DSCID is a Neighborhood Improvement District, established by ordinance of the Borough of State College in accordance with the laws of Pennsylvania. The District extends from Atherton Street to Sowers Street, College Avenue to Highland Alley. With over 350 participating businesses, DSCID sponsors annual events, promotions and other civic-minded pursuits that add value to the State College experience.